Frank Ober of Intel’s Solutions Group will review how he achieved 1+ million transactions per second on a single dual socket Xeon Server with SSDs using the open source tools of Aerospike for benchmarking. The presentation will include a live demo showing the performance of a sample system. The state of Key-value Stores on modern SSDs. What choices you make in your selection process of hardware that will most benefit a consistent deployment of Aerospike. 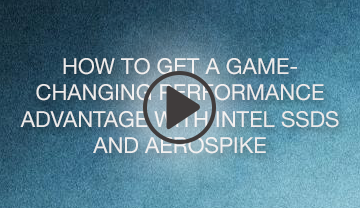 How to run an Aerospike mesh on a single machine. How to work replication of that mesh, and what values allow for maximum threading and scale. We will also focus on some key learnings and the Total Cost of Ownership choices that will make your deployment more effective long term. We will provide additional tools and resources for you to work with and explain why we use those tools. The presentation will be followed by a live Q&A session. Frank Ober is a member of Intel’s Non Volatile Memory Solutions Group. Frank focuses on database use cases for Intel in the area of Storage and optimizing for the use of Intel Solid State Drives.